In a recent “on the couch survey“, I interviewed two male focus groups to learn intimate details about how friendly they felt towards decorative throw pillows. While they generally don’t openly ‘chat’ about throw pillows, guys have a lot to say when asked. The first focus group, cheered on by Paul Anater of KitchenandResidentialDesign represented a group of professional men as interior designers or in related industries. The second group of men were some favorite and very noteworthy techs and SEO experts such as David Naylor. There was a third group that just weren’t into pillows. That conversation was too short to record! My “on the couch survey” was me sitting on my couch with my laptop, emailing my select group of respondents who were also likely sitting on their couch with their laptops. An unscientific, informal process with simple pillow questions requiring no analysis, produced some hilarious MAN ANSWERS but mostly, some really candid opinions that should make all of us in the design world sit up and listen. 1) Men either avoid, tolerate or embrace pillows. Male designers are pillow advocates because it is part of their business and they naturally gravitate to them because of the design element they can add. Male techs take their work home, usually to their sofa where undoubtedly there is a pillow(s) close by. For them it’s not just comfort but they want their space to look good. Identify and target market the profiles of men that show enthusiasm for pillows. 2) If a man likes 2 pillows, he’ll still like 4, but will probably object to 12. He doesn’t want to move pillows from the couch or the bed to relax. I recommend focusing pillow inventory on sofa cushions rather than bed pillows! 4) Although they didn’t ask for “washable”, men don’t want to worry about marking or making pillows dirty. Men will replace pillows more frequently when they are “worn-out” or used up (dirty?) however they won’t spend as much on them as women do. Recommend offering more “man pillows” in lower price ranges ($20-$35 range) rather than using high-end fabrics and labor intensive designs. 5) Men often buy pillows in pairs, I suspect that it’s easy decorating for them knowing that at least two of something in the room matches. Recommend marketing pillows in multiples or a co-ordinated set of 3 or 4 so the decorating decisions are easier for them. Consider building in price incentives for multiple purchases. 6) Men prefer square pillows at least 16 inches square, all the way to 36 inches square so they can also be used for floor pillows. Rectangular pillows are less preferred except for lumbar pillows for back support on the sofa. Interestingly men avoid round pillows, bolsters or small fru fru pillows. 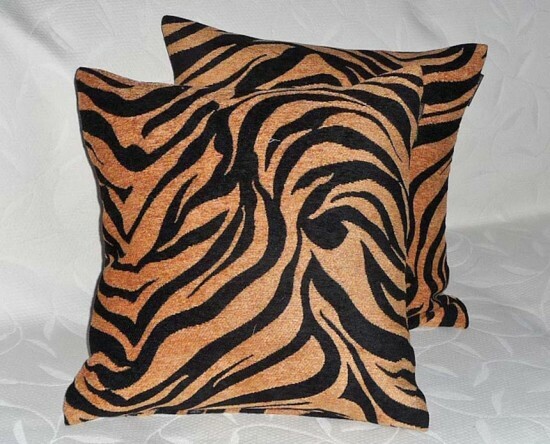 Recommend more 18 inch square throw pillows with custom options for larger. 7) Men gravitate to darker colors or “earthy” colors… some said because it hides the dirt. Dark colors are thought of as “safe” color choices. Next choice after dark colors is tan or “neutral”, again for safe color choices. There was some interest in “trendy” colors such as the naturals and metallics especially those that would look good with leather furniture. Allrighty… metallics coming up! 8 Men look for either “interesting” or “textural” statement pillows whether or not they match. In the opposite extreme othey choose pillows that “blend” in and make no statement at all. They expressed interest in animal prints, faux furs, pillows with pictures or something printed on them (face or letters), plaids, houndstooth, abstracts, solids and stripes. It’s not all the Ralph Lauren look… the gender gap in throw pillow decor is definitely narrowing. 9) Lastly, men pick pillows more from their picture than their title or their description. Very visual!!! I recommend good pictures and label, caption and alt text your pictures so they are SEO friendly! Men are going to be a force in the world of throw pillows. This isn’t just my opinion. Lots is being written about men, guys’ and dudes’ spaces. Yesterday’s article at Fast Company’s Co. Design blog “If a Dude Wants Throw Pillows, Where Can he Go” describes a new shop in Brooklyn specializing in masculine interiors. So for all of you guys, dudes, and men, you can get your throw pillows here at PillowThrowDecor… my 2010 Fall Throw Pillow Collection of over 100 different pillows is dedicated to YOU… well at least half of them are 🙂 Subscribe to my Etsy Shop Feed or copy and paste http://www.etsy.com/shop/pillowthrowdecor/rss to see the the new throw pillows as they are listed throughout the next week! One last favor to ask all of you…. Below, I have compiled a list of all the words that men use to describe pillows. So that I can make my marketing more effective …Please tell me the words that YOU would use to search Google or elsewhere on the internet to find your perfect pillow. Functional, comfy, unfussy, uncluttered, architecturally clean, plain, spare, cheap, simple, no muss-no fuss, straight forward, straight lined, minimal, larger scaled, muted colored, tan, brown, earthy, dark, masculine, metallic, gray, silver, bronze, pewter, black, khaki, neutral, natural, leather, plaid, tweed, herringbone, houndstooth, woolly, textural, country, nubby texture, faux fur, stripes, sturdy, pet friendly, sophisticated, contemporary, primitive, tribal. Brava Christine! Great market research and it was both a pleasure and an honour (I added the “u” to honor as a sign of respect) to play a small tole in all of this. Having a hard time buying zebra print throw pillows for my couch. Can you help? Glad to see the research paid off! As one of the design guys, I certainly like throw pillows(4, 12 or otherwise). Thanks for stepping out of the box and sharing the good stuff you discovered. My pleasure Nick! i learned a lot! Thank you for being part of the focus group! Who knew Pillow Marketing could be so fascinating? Wish they had a course on this when I was in MBA school. It might have set me on a new career direction. PillowThrowDecor, you’d be a great adjunct professor on this subject! They are good for throwing & bending. I like cats now, though; maybe there is also hope for throw pillows in my world. Christine — I think it is amazing that you were able to pull something like this together. Good, insightful info here. And I was priviledged to participate.